Let’s say you’re in Buenos Aires and you’re looking for a class or milonga. Typically, you might do some research using the internet or follow the advice of someone you don’t know that well, which could lead you to missing out on what only Buenos Aires has to offer in relation to Tango. This is because Tango is not a commodity. Tango is an apprenticeship. You do not get Tango the way you get gasoline. It’s not like you can go to any place, or the cheapest place, pay, fill up, and leave having acquired Tango. 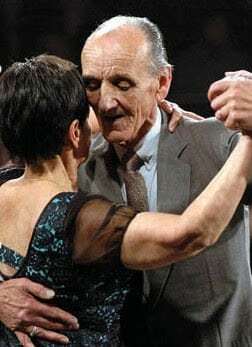 You learn Tango from a “Maestro”. The responsibility of your Tango teacher is to be the bridge between your life before Tango and your transformation into a milonguera or milonguero. You also have a responsibility on your journey, which will require passion, courage, commitment, discipline, stamina, focus and patience. You must be willing to jump wholeheartedly into Tango. You want to learn to dance Tango. Why? Because you are meant to do it. The rest is either preparation or avoidance of it. If you were in a place affected by war, you would either drop out by hiding away, or escaping; or you would choose a side and fight. In peace we are able to be good and beautiful, and we should choose to be as such. Tango is a language that allows you to speak with your whole being. Your entire body is talking, in verses, or in a poetic prose, with an everyday colloquial conversational style that can speak in very deep and charming phrases. Why should we choose to be charming? As well as we are always learning, we are always educating others. It is inherent to our human nature. We must charm to bring others into the task of making this world the way we can be proud of it. Why are we so insecure when we start dancing for the first time? Because we are exposing ourselves. We realize how transparent we become when dancing. We could hide who we are to others by not dancing, even by learning and rehearsing a choreography, perhaps. We can hide ourselves to others by acting as a character instead of being who we are. But Tango is improvised. It requires spontaneity. By exposing your weaknesses, you can begin to work on them objectively and improve. Learning to be a milonguera or milonguero requires a sensitivity to its inherent value. This is another area where a Maestro can be valuable. Right now, Buenos Aires is the only city in the world in which there are certain milongas where this system of ethics and aesthetics is the norm accepted by all the participants. It starts with the hosts, the DJs, the wait staff, the regulars and all others who attend. Are you willing to miss out? You may like to read also: “The Tango Journey” Read… and “How to best take advantage of my classes?“ Read… and Tango is education”, click here. Also “What is your goal in learning tango?”, click here.